This is not an eyeball. Instead, this is the eye of the Pacific Ocean after the 8.9 earthquake in Japan on Friday March 11, 2011. It does look a bit bloodshot. But those red lines show the intensity of the tsunami that rocked and rolled the coastlines around the Pacific Rim all day today. I heard a little bit about the earthquake Thursday night just before I went to bed. On Friday morning, I picked up the phone to call a friend about carpooling to yoga at the Buddhist Temple. I was surprised to see three phone messages there, two from my son’s school and one from a friend. I listened to her message first to find out school had been canceled for my son because it is located so close to the beach; the police and fire departments were concerned for the safety of the children. Next I listened to the one from the school superintendent and from his school principal; they confirmed that indeed school was canceled due to a tsunami warning. Better safe than sorry of course. But it meant I wasn’t going to yoga. I learned from facebook friends that the tsunami was due here along our southern coastal California waters soon and it was only going to be about a 3′ swell. Our house is located on a bluff about a half mile away from the ocean; I reassured my son our house was fine and we jumped on our bikes and rode toward a good vantage point where we joined a small group of people. There wasn’t much to see. I didn’t even bother to take any photos, not even with my iPhone. The ocean did look a little different at times–maybe it was receding here then swelling there but nothing too unusual. More and more people hustled down the hill–the parking areas looked as full as a sunny summer Sunday. I talked with a woman who remembered me (and my bikergo!) from an event at the college. I struck up a conversation with a science teacher at the nearby middle school. Mostly we sat in the warm morning sun, smelt the salt breath of the sea, and watched and waited. Eventually, we rode home–the long way. I let my son lead and we meandered here and there and by the pier (closed) and over the pedestrian bridge. Everywhere we went we saw people peering out toward the ocean. There were reports all day of the water being disturbed but no calamities around here. We were much more fortunate than those in other coastal waters, such as this harbor in Hawaii after the tsunami as photographed by Peter Liu, a facebook friend who posted the link to the photo above. You can see this photo for yourself here: NOAA Environmental Visualization Laboratory – Tsunami Wave Height Model Shows Pacific-Wide Impact. 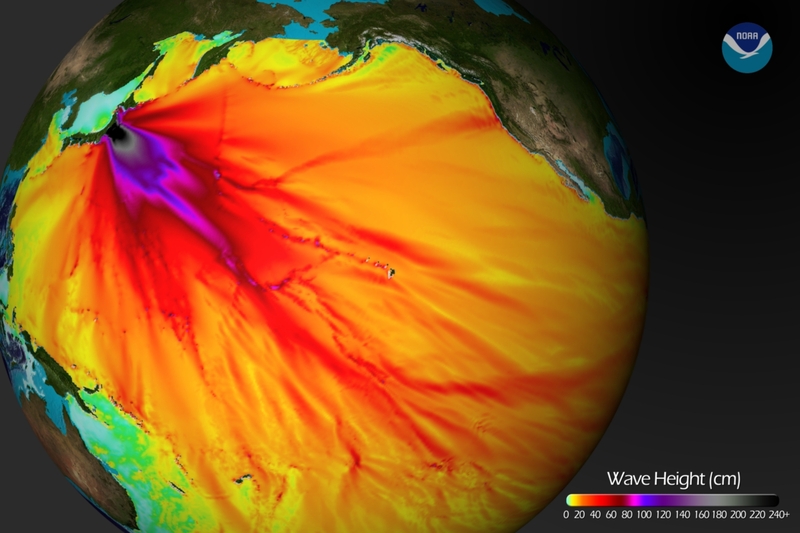 You can watch an animated view of the tsunami’s impact here. ← See March ArtRide Photos! Join us for Saturday’s St Pat’s Parade Ride 3/12! This is amazing, tragic, and in some aspects eerily beautiful. If one is able to look for a moment past the devastation, the graphics are impressive. The pictures from Peter’s site brought it home, and the story you told of how lucky you were compared to the folks in Japan and other places shows you know how to count your blessings. Thanks for the mention. I’m glad the tsunami wasn’t more than it was for us. I wish Japan could have fared better. Stay safe over there!